Can a Drone Lift a Human? The Fun We Had in 2016! 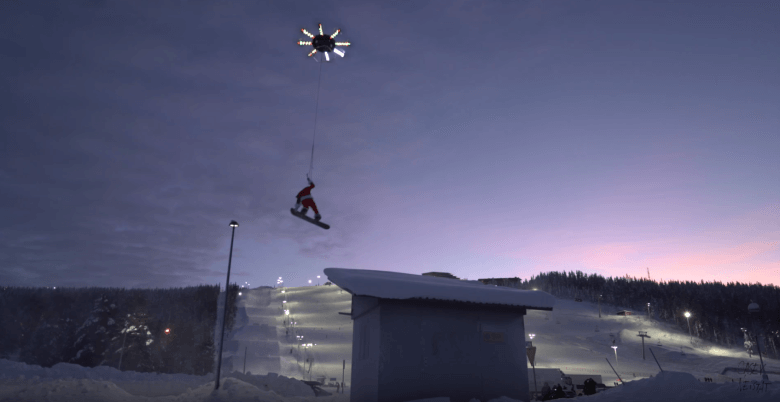 I recently viewed a YouTube video by Casey Neistat and Samsung, where a massive drone is lifting Casey over buildings. The drone used to accomplish this was a 16 motor hexadecacopter. It uses carbon fiber propellers and has 16 independent motors. It is 10 feet wide and weighs 165 pounds with 16 batteries and 1065 pounds of thrust. A spectacular marvel of technology to say the least. Let’s talk about rules and regulations for a moment. This drone is not legal to fly in the United States without direct approval by the FAA. The operation of a drone of this magnitude without the proper approvals could land you in some very hot water. We are talking major fines, if not jail time. I bet you are wondering how did Casey Neistat pulled it off. He traveled to Finland, which has less restrictive laws when it comes to drones. A word to the wise for anyone who is interested in trying something like this. Do Not lift anything that breathes, and make sure you are ready for this investment. It is no small task. A drone of this type costs tens of thousands of dollars and hundreds of hours of labor to build. I recommend starting small. Build a rig for a couple hundred dollars. This will familiarize you with the tools, parts, and flight controls required for UAS systems. Also, if you crash a two hundred-dollar drone it isn’t the end of the world. If you want to go into business that involves using drones in a commercial capacity, you will need to first pass an exam giving you the Remote Pilot in Command Certification and then register your drone with the FAA. Certified Training Institute provides the FAA Commercial Drone (UAS) exam preparation course in full video with Greg MacMaster, the UAV Pilot who provided the content to the FAA for the exam. This entry was posted in Drones and tagged Drone Rules, Drones, Flying, Human.